We have begun a Facebook page to keep members informed and in touch with opportunities and events. Please visit Fencing Mid South and stay in touch with opportunities and events around the region. Mid-South members and associates, you can now receive our regional e-news and updates, by email. Subscribe for faster information and communication. Simply send an email to midsouthnews@maxnet.co.nz with subscribe in the subject line. You may also offer suggestions, make requests or ask a question using the same email address. 2011-05-01 18:01 - Australian U15 and Cadet (U17) Championship 2011, Perth WA. Nominations are invited for those wishing to attend the above competition. Criteria: All those nominating must have competed at the appropriate NZ Championship event in 2011 or provide a acceptable letter of explanation for non-attendance. Please note, that in the event that insufficient fencers nominate, a manager and/or referees may not be sent. Any queries, please contact the Secretary-General at the email address above. This is offical notice of the North Island Championships, Above is the North Island Fencing Champs Info/Entry forms which this year is being hosted by Fencing Central at Victoria University on June 4th/5th. Please forward this information to all clubs, coaches, athletes and respective parents. Following feedback regarding the fees, please be advised that these have been reduced. The first weapon entry is now $50, the second weapon entry is now $35. The teams entry is now $45. With clarification from FeNZ, the teams event has to be split into two events - one the regional teams as selected from all fencers for the region and the second being a schools event with teams coming from single schools. My apologies for any confusion regarding this. Both teams events will take place on the day specified in the timetable already and the school event will follow the regional event. I have included an updated entry form. This is also a reminder that all entries must be received by July 9. Congratulations to our new North Island Champions; Katherine Taylor (Mid-South), Women's Sabre; Judith Flitsar (North), Women's Foil; Francoise Henner(South via Switzerland), Women's Epee; Luke Robertson (Mid-South), Men's Sabre; Paul Hentschel (Central), Men's Epee; Michael Hoskins (North), Men's Foil. Well done to all the finalists, and thanks to all the participants for making the events so great. We enjoyed your passion and enthusiasm. Thank you to all the referees and everyone assisting with the support and organisation of the event, and finally to our hosts Fencing North for providing the opportunity for this great event. There were many special moments. A magnificent bout was fenced in the Men's Foil DE between the youngest competitor, Clovis Dyson aged 13 and the oldest competitor Rex Hefferen aged 72, showing we are a "sport for all". Rex had a very good day and reached the last 8. He also won the Richard Peterson Trophy for Style. The Annual General Meeting of Fencing New Zealand will be held on Saturday 27 March 2010, commencing at 1.00pm at 16 Anderson Grove, Lower Hutt. All those who were financial members of Fencing New Zealand for the year 2009/2010 are entitled to attend the Annual General Meeting. FeNZ equipment standards and current rulings, including non-use of clear view masks, will apply. Entry forms will follow shortly. Notice is hereby given that the Annual General Meeting of Fencing New Zealand will be held on Saturday 27 March 2010, commencing at 1.00pm at 16 Anderson Grove, Lower Hutt. Notices of motion for consideration at the meeting must be in the hands of the Secretary General no later than 5 March 2010, and may be sent to the Fencing New Zealand at PO Box 99284, Newmarket, Auckland 1149. Nominations for office holder positions and for Selector/s should also be sent as above. When nominating people for positions, please ensure that there is a seconder for the nomination, and that the nomination is signed by the nominator, the seconder and the person being nominated. Copies of the agenda, including any notices of motion and nominations will be circulated prior to the meeting. Paris, Saturday 6th February Felix Boyce (Toa Rangatira Fencers, Wellington) will be lining up on the piste at probably the largest and most prestigious age category international foil championship event to be held anywhere in the world. He will be the first New Zealander to participate in this event. He will be lining up in the combined Men's age category Minimes (96-95, age 13-14) and Benjamins (97-98, age 11-12). The next older age category is strictly restricted to cadet fencers (94-93, age 15-16). Paris, 8am, Saturday 6th February, Felix will be at the piste, ready ... with a whole nation of Kiwi supporters on your side ... Go Felix, Kia Kaha. Clovis Dyson wil also be participating in this competition and heads to Paris today. He has spent the summer training with his coach, Anya Kamynina, and also participated in the Hign Performance Fencing Camp in Auckland last week. We wish him all the best for his competition. Kia kaha Clovis. The overall winners of the inaugural 20+ in Christchurch. Thanks to Mid-South and Marguerite for proposing this new event and our host, The Fencing Institute. It was a great opportunity to bring together our adult fencers for fun fencing and to enjoy a social event. We thank Chris Bell, Sally McCance and Hamish Clarke for their refereeing and floor controlling. We also thank Kate and Martin Brill for organisation. Then finally a massive thank you to all the participants and especially to those who went that Extra Mile and traveled by road and plane from Dunedin and Wellington. See you all again next year. Click here for more on the Over 20 competition, format and what happened. Monique Coleman of Wellington's Hutt Valley Fencing Club struck Gold for New Zealand, twice, to take the Oceania Champion’s title in the individual Women's Foil and Women’s Epee events. Monique, our new double Oceanic Champion lined up in the Women’s Epee Team event with Nancy Liu (Auckland University Fencing Club) and Susan Grant-Taylor (HVFC). With some great team work, they combined strongly. They won and took a third gold medal and the Women’s Epee Team Oceania Champion title for New Zealand, a Champion’s title each for Nancy and Susan, making it a hat trick of gold around Monique’s neck. "It was great for our fencers, to be able to fence and perform against the strong fencers from Australia, New Caledonia and for the first time the very good fencers from Tahiti." said Susan-Grant Taylor, our Association’s President. "The New Caledonians presented a wonderful event and were very welcoming." More results and details when received. A bequest of a new trophy has been accepted by Fencing New Zealand, from the late Murray Goodman who was a passionate Association member, supporter and fencing coach in Christchurch and also coach at the Christchurch Fencing Academy. The Goodman Trophy will be contested between the men's and women's foil champions. It will be awarded for the first time after the National Championship foil finals being held at Auckland Grammar School 1pm - 3pm on Monday 26th October. The Goodman Trophy winner will be the men's or women's foil champion who scores the greatest percentage of the possible hits to be scored throughout their foil events. The Association thanks June Goodman and her family for the Trophy in memory of Murray and the kind financial donation to the Association. A preliminary timetable for the 2009 National Championships (24 - 26 October) in Auckland is now available. Information and entry form can be found here. Women's Foil Final Yuan Ping vs Nora Erle, Men's Epee DE Christian Linke vs Andreas Sesun, Men's Epee Final Christian Linke vs Paul Hentschel ... click here... Footage provided by Bryan "Baz" Clarke ... many thanks, enjoy! See the fencing action. Video of New Zealand fencers. A new section for viewing video of our fencers available on our site, go to Information - President's Corner>Gallery>Video. To start the ball rolling, we have the last few hits of the 2009 Under 15 Championship finals, Men's and Women's Foil. Check it out. More coming soon. The Information - President's Corner has also been updated. Old out of date information has not been deleted (not yet). It has been relocated now at the bottom in Archived/Old Info. The finals were a triumph for the youngest at Dunedin’s Queens High School. 2009-04-04 19:16 - Round the Regions "AGM Report"
Fencing Central and Mid-South Annual General Meetings held. “One area continues to be weak and we must find ways and means to attract adults to join the sport and provide both men and women with programmes suitable for their introduction and development,” Keith Mann said. Mr Mann also congratulated the many initiatives from last year which increased fencing activity and made special mention of Canterbury’s new “School League” (meets on Friday evenings at the Fencing Institute, Jack Hinton Drive), the founding of the Sabre Club (same venue Wednesday evenings) and the well supported and well run Under 13 competition and training week-end in December. Information and entry form for the New Zealand U15 & Cadet (U17) National Fencing Championships can be found here. 1) Finals will be held on the same day an event is run. 2) U15s will be a separate event, not mixed. For further information on equipment requirements click here. If you require further clarification, please email the organisers. Fencing NZ rankings for 2008 are now available on the FeNZ website. If you notice any errors please let us know what they are. Many thanks to Kyle Macdonald for all the work he has done to get the rankings functioning again. Many thanks to to Steve Martin for the assistance that her gave to Kyle. Remember that from now on, for the rankings to be any use we have to play our part and send results of competitions to Kyle promptly. Notice is hereby given that the Annual General Meeting of Fencing New Zealand will be held on Sunday 5 April 2009, commencing at 1.30pm at 16 Anderson Grove, Lower Hutt. Notices of motion for consideration at the meeting must be in the hands of the Secretary General no later than Saturday 14 March 2009, and may be sent to the Fencing New Zealand at PO Box 99284, Newmarket, Auckland 1149. Nominations for office holder positions should also be sent as above. When nominating people for positions, please ensure that there is a seconder for the nomination, and that the nomination is signed by the person nominator, the seconder and the person being nominated. All those who were financial members of Fencing New Zealand for the year 2008/2009 are entitled to attend the Annual General Meeting. Due to unforseen circumstances the Annual General Meeting, which was scheduled for 28 March 2009 will now NOT be held on that date. The new date will be notified on 8 March 2009. From all of New Zealand, from our hearts, we wish them well – Kia Kaha, Stand Tall, Be Proud. With now just 16 sleeps to go, our junior foil fencers ended a solid training week-end focusing on team fencing with invited sparring partners from Wellington Dunedin and Christchurch. A new document "Pathways For Success" is available in Information - President's Corner. It is difficult to find good dependable and reliable information on appropriate training and development for Cadet and Junior fencers. 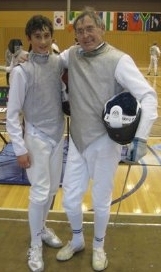 For these fencers and their parents, who are either new to the sport or wish to develop their talent, skills and abilities to higher levels, or who aspire to international representation and sucess the following document from the Australian Fencing Federation provides a useful and practical indication of the steps required to find the pathway for success. Use the following link to go to Information - president's Corner to see "Pathways For Success", the Australian Fencing Federation Guidelines for the Successful Development of Internationally Competitive Australian Cadet and Junior Fencers. Time to start planning the new fencing season and your competition and training program for 2009. Some useful competition events that you may wish to consider are now available in the menu option "President's Corner", under "General Fencing", called "Competitions - Beyond Your Region and Overseas"
There were 36 participants from Otago, Wellington and Canterbury region, from age 9 to 13. At the week-end of 22 November, Susan (Sue) Grant-Taylor took over the Presidency of Fencing New Zealand to guide the Association. Martin Brill had stood down after six years as president to devote more time to fencer and coach training and development. The Minimum Equipment Standard for FeNZ Competitions has been approved and is available on the FeNZ web site. Go to President's Corner. This supersedes the previous standard and is effective immediately. Expressions of interest in selection for the Junior Commonwealth Championships to be held in Penang, Malaysia, February 16-21 2009 are being called for. Please contact the National Selector if you wish to nominate yourself for selection. The Southern Invitational Epee event was spectacular, the fencing was both intense and sublime, the 60+ spectators for the final were enthralled and the warm welcome for the 28 competitors from throughout New Zealand was tremendous. In all $1400 worth of prizes including 7 spot prizes were up for grabs. Kate Brill was highest placed women in the mixed event and the event attracted extensive print and television coverage. Thank you to Brendan Lyndsay the Epee Maister, Mastermind and Power house for organizing the event. The 2008 National Secondary School Championships were held this week in Auckland. Well done to everyone and congratulations to our medalists and finalists. Thank you to all our supporters, helpers and coaches accompanying the fencers to the championships. For final placings of our fencers click here. Fencers from all regions were represented in the Under 15 Championships which is only contested in Men's and Women's Foil and included one competitor from Melbourne, Australia. The Championships continue with the Cadet (ubder 17) Men's and Women's Foil on Saturday and the Cadet Epee and Sabre events on Sunday. More results as they come to hand over the week-end. We are pleased to announce the New Zealand Community Trust has granted us $15600, to support our team traveling to the Asian Fencing Championships in Bangkok next week. The team is leaving this coming weekend to compete in both the Asian Fencing Championships and the Asian Zone Olympic Qualifying tournament. We are very grateful and appreciative of the NZ Community Trust for their support in this project, as well as the support they have given us in the past and we wish our athletes the best of luck in Bangkok. Immedaitely prior to the 2008 Asian fencing championships, three fencers have been selected to participate in the 2008 Olympic Qualifier competition as future development fencers (only one person per country per event allowed): Laura harvey (WF), Michael Hoskins (MF), Adrian Saw (ME). Nominations are now called for Patron, President, Secretary, Treasurer. Nominations and any remits for the AGM (e.g. changes to constitution or By-Laws), notices of motion or notice of matters which a Provincial Council wishes to be placed on the agenda must be received by the secretary on or before the 8th March 2008. We recognise and acknowledge Volunteers who through their outstanding generosity, efforts and commitment provide a valuable contribution to our communities, making a difference to people's lives every day. The 5th December is International Volunteers Day and we join with all communities, world wide, celebrating the contributions of our Volunteers. To all our Volunteers, thank you and we salute you. A report on black card offenses at New Zealand events has been received by FeNZ from Kate Brill of our Referees Panel and the issues identified will be discussed and actioned by FeNZ. All Prime Minister’s Scholarships will now be aligned to SPARC’s High Performance Strategy. Only those people with the ability to impact SPARC’s high performance mission of “more New Zealanders winning on the world stage” will be eligible to be considered for a scholarship. Our sport will no longer have guaranteed five scholarships. The athlete scholarship programme will be contestable within and across sports. to be recieived by FeNZ by 5PM 15 NOVEMBER 2007. Jessica Beer is our only fencer representing New Zealand at the 2007 World Championships in St Petersburg, Russia. Jessica Beer started well in the Women’s Individual Epee event. Three cliff hanger bouts won 5-4, by the narrowest of 1 hit margins, set the scene for Jessica to gallop away in the first round with 5 victories from six bouts; (Monika Sozanska (GER) 2-5, Diana Romagnoli-Takouk (SUI) 4-5, Lydiya Vorobiyov (ISR) 1-5, Nina Westman (SWE) 4-5, Kristina Kuusk (EST) 4-5. Only one fencer was able to slow Jessica down. Jessica met her match with a 0-5 loss to Tatyana Ruban (KGZ). Jessica having qualified 24th, missed exemption from the preliminary tableau of 64 so had to compete for a direct entry to the top 64 Direct Elimination Tableau where she confronted Olga Aleksejeva (EST). A tough bout with the Estonian leading at the end to take the victory 15-11 and bringing Jessica’s good run to an end. Jessica Beer’s final placing 65th out of 128 fencers. Reminder regarding entries for this competition. At the request of the Australian Fencing Federation,entries are only accepted when made through Fencing New Zealand. This is to ensure that fencers from New Zealand are current members of our Association. About $40,000 worth of fencing equipment has been stolen from the New Zealand Academy of Fencing in Auckland, crushing junior members' dreams of competing in their first tournament. 25 weapons, clothing, masks and aluminium pistes were taken. Athlete Application and Athlete Agreement forms can be downloaded. These have to be sent to Fencing New Zealand for confirmation of being a member and processed by FeNZ. Closing date for reception by FeNZ will have to be 12th September 2007 in order for us to meet the reception by NZOC deadline of 14th September 2007. The standard for nomination by FeNZ to NZOC for consideration for selction by NZOC reflects the NZOC objective. We are advised that recently Tony Ellis of Wellington passed away. He was a well known Wellington lawyer. In his younger days Tony was also well known on and around the pistes, especially in his days at University. Though never winning a National individual Championship fencers were pleased to be in the same team with him rather than against him. He was an active supporter of University fencing. He was manager for the first New Zealand University tour to Australia. Our Association extends its condolences to his family on his passing, and with many fond memories of Tony, I am sure we all join in a final salute to Tony Ellis. It is with great sadness that we learn of the recent passing of Neil L'Amie former Secretary / Treasurer of the Commonwealth Fencing Federation. Neil passed away peacefully on the evening of 4 September 2007. We are grateful for his vision and passion for fencing which inspired him to take on the stewardship of the Commonwealth Fencing Championships and the Commonwealth Fencing Confederation after fencing was no longer on the Commonwealth Games programme. Our Association extends our condolences to his family. Expressions of interest are now being sought for support staff for our fencers and teams competing in the 2007 Australian Junior Championships. We are currently seeking a minimum of one person, but more positions may be required, in function of the team size. Please provide details of your area of expertise and area you wish to be active in to support our fencers. 2007 Australian Junior Championships are open to all fencers aged under 20 on the 1st January 2007. Fencers will be selected for one New Zealand team in events where there are sufficient fencers available. The Team entry will be paid for by Fencing New Zealand. Selection will be based on performance from the individual event, with priority to the highest placed fencers. Fencers wishing to be considered for selection for the teams events may indicate this on the entry nomination form. Each fencer is required to make a one hundred fifty dollar ($150) deposit to FeNZ with their entry/nomination. The deposit will be used by Fencing New Zealand to pay the fencer's entry fee and the balance to be used to defray Fencing New Zealand's costs associated with my participation (FeNZ appointed team support personnel). Fencing New Zealand may refund part of the deposit not required to cover team expenditure. The deposit is none refundable in the event of the fencer not participating, for any reason. Congratulations to Jennifer Hope for her 16th place in the Women's Epee Individual. Well done and thank you to all our fencers. A special thank you to our support staff with the fencers, Daniel Chan and Barry More. Also a very special thank you to the FeNZ support staff who did not travel with the team and ensured the team's participation - thank you Laura Harvey, Steve Clarke and Gareth Foley. Finally a big thank you to the Commmunity Trust for their support of the team. Results for all our fencers and teams have been updated here. Congratulations to Bridget Mcfarlane who successfully completed her Australian Coaching Council Assessment for Foil Level 1 Fencing Coach. We wish our fencers well ... Kia Kaha ... from August 22-27th our fencer will compete in the 2007 Asian Fencing Championships in Nantong, China. We have fencers competing in the Men's and Women's Foil and Epee Individual and Teams events (no available fencers for Men’s or Women’s saber). This event is special for our fencers and New Zealand fencing as it is the first time that New Zealand has been invited to participate in the Senior Asian Fencing Championships. We are very grateful to ,The New Zealand Community Trust who have provided financial support for our team which allows us to have our team participate. On day one, the first day of the fencing, Andreas made just 2 victories from 6 bouts, in the Individual Men's Epee, which sadly was not enough to make the cut for the Direct elimination tableau. Final placing for Andreas was 59th out of 63 fencers. Kia Kaha! We send Andreas Sesun our very best wishes. Andreas steps on to the piste tomorrow for the preliminary round of the Individual Men's Epee at the2007 World University Games in Bangkok. There is some confusion regards the validity and date which is on the on the FIE labels. There is no “limit of validity” or “specified duration” for use by fencers of equipment carrying the approved FIE label. Also at all competitions, irrespective of it having an FIE label or not, equipment must conform to the rules for the event and the “on the piste” conditional testing carried out by the referees and weapon control. For more information click here or go to "President's Corner", FeNZ article "FIE Labels on Equipment"
To all the medalists, congratulations and well done to all participants. A big thank you to the hosts and organisers, all the referees, caterers, coaches, helpers and the parents. Thank you. We wish to remind fencers that dates of the championships start on the 6th July not the 5th as is incorrectly indicated in the Calendar. For those fencers who have had difficulty in obtaining entry details entries can be made to Marguerite by email or text message. • Address, phone number, cell number and e-mail. Please put “New Zealand under15/17” in the subject line of e-mails. Congratulations to Roch Cahan who placed 6th in the Men's Epee final of the D H McKenzie, AFF No2, in Perth. An intense quarter final bout against 5th seed Mathieu Meriaux (WA, Perth) saw the score reach 14-14, but the golden hit went to Meriaux, who then went on to Gold Medal. Jennifer Hope competed in the World Cup Women's Epee in Havana, Cuba. At a FeNZ meeting on 2 June the Executive endorsed a proposal that the Commonwealth Junior and Senior Championships, scheduled for 2009 and 2010 respectively, become the designated focus events for the high performance programme over the next three years. In addition, it was agreed that FeNZ would investigate submitting a bid to run the 2009 Junior Commonwealth Championships. While there are a number of reasons why it is deemed appropriate to target these events, it was agreed that this level of competition accurately reflects our current stage of development and also the SPARC requirement that we compete in events “that are of significance to New Zealanders”. One immediate impact of the decision to target Commonwealth Championships is that participation by FeNZ mandated teams in competitions between now and the two Commonwealth events will focus primarily on preparing for those events rather than simply the competition in question. In order to assist to determine demands on support that may be required for both individuals and teams over the next three years can you please review the attached form which lists a number of competitions that we believe may be relevant to preparation for the two Commonwealth Championships and indicate whether or not you intend to be available to compete in them. SPARC's inaugural Connecting Coaches Convention in Wellington exceeded all expectations – SPARC's and the 550 coaches who attended. "it was great. It provided an openning for my personal coaching development which will be reflected in opportunity for athletes and coaches I will now work with" said Martin Brill, participating coach. The Asian Fencing Confederation has extended to New Zealand invitations to participate in their Fencing Championships. Fencing New Zealand are accepting the invitations and wish to select full teams for our first participation at the 2007 Asian Fencing Championships, to be held in Nantong, China, from 22nd - 27th August 2007. Fencers wishing to be considered for selection must nominate themselves, specifying their weapon, to FeNZ by 19th June 2007. All nominations, to be valid, must also include a signed copy of acceptance of the Fencing New Zealand Code Of Conduct and Guidelines for Conduct of Participants in National Team Activities. FeNZ is currently seeking funding and sponsorship to assist fencers and officials with the costs of their participation. Fencers may be required to cover part or all the costs of their participation. A week-end of strong international performances for our fencers saw New York based Sarah Raudkivi (Women's Foil) and Europe based Jessica Beer (Women's Epee) reach the direct elimination of 32 in FIE World Cup events being held in the America's. Sarah competed in the "Coupe Buenos Aires" placing 29th and Jessica Beer the "Montreal International Women's Epee" placing 32nd. Congratulations to both fencers who now jump up further through the world rankings. Congratulations to Andreas Sesun, nominated by FeNZ for the New Zealand Team for the Student Games to be held in Bangkok, Thailand, 8-18 August 2007. His outstanding NZ best performance at the 2007 FIE Men's Epee World Cup in Sydney was sufficant to exceed the University Sport New Zealand qualifying standard for nomination for the Student Games. He also picked up 2 world cup points and that now pushes him up to 321 out of 845 world ranked men's epeeists. Well done. Each month includes reproductions of engravings from Domenico and Henry Angelo’s eighteenth century treatises on fencing. 2007 from 12 to 15 July 2007. Singapore cordially invites our fencers to participate in the above competition so that it will be a successful one. Final entries by name must be received by 15 Jun 2007. Please advise FeNZ if intending to compete. The New Caledonian fencing club, the Mont-Dore Musketeers, invites you to its épée fencing challenge, to be held in the gymnasium of the Boulari Sports Complex on the 21 th and 22 th July 2007. Open invitations to this year's event have just been posted on our website http://www.comrades.org.nz. We hope to see as many of you along as possible. Also the on-line entry form has been posted along with the competition rules and conditions. Any questions or concerns please get in touch. We extend our condolences to Richard Peterson, his sons and daugher Stephen, John and Elizabeth and their families for the passing away of Hillary Peterson, wife and mother, mother in-law and grandmother on Sunday after an extended illness from cancer. Our thoughts and prayers are with them at this difficult time. On behalf of the family, Richard sends his appreciation for the support of the community of fencing. A funeral service was held at Old St Pauls, Wellington on Thursday. Congratulations to the team and fencers, well done. Thank you to the Management, Coaches, Team Captain’s, and all Team Assistants, Parents and Supporters. Double individual Oceania Cadet Champion in Women's Foil and Women's Epee and double Oceania Cadet Team Champion in both the Women's Epee and Foil Team. Oceania Cadet Individual Champion Men's Foil Champion and Oceania Cadet Team Champion in both Men's Foil and Men’s Epee. Men's Epee, the "Weißer Bär von Berlin", a German national circuit competition, Henry Thomson placed 166th, 211 fencers. Eliminated in first round, two victories out of six bout. Medalists were; 1. Sven SCHMID (GER FC TBB), 2. Norman ACKERMANN (GER FC TBB), 3. Sascha LUDWIKOWSKI (GER Bayer 04 Leverkusen), 3. Vitaliy MEDVEDEV (UKR). 2007-02-20 17:43 - NOTICE OF ANNUAL GENERAL MEETING FOR 2007. Notice is hereby given that the Annual General Meeting of Fencing New Zealand (New Zealand Amateur Fencing Association Incorporated) will be held on Saturday 31 March 2007 at 2.00pm at the FenCentre, 69 Tasman Street, Wellington. Oceanic Fencing Master Academy (OFMA) Level 1 foil and epee coach training courses are now being held in New Zealand during 2007. The course dates are below. Each course consists of a total of 20 hours instruction held over 4 week-ends (2 hours Friday evening, 3 hours Saturday morning). Jessica placed 132nd in her first World Cup of the 2007 Season. Jessica next fences in the Czek Reublic, the "Prague d’Or", Prague - 27.01.07 and then Rome for the "Tournoi international Rome" on 09.02.07. She takes a short break before fencing in Challenge international de St-Maur , Paris 24th February and then the "Würth Cup " Tauberbischofsheim, Germany on 3rd March. Due to the positive response to planning, the executive have chosen to change the planning approach so as to ensure everyone who wishes to participate can have the opportunity to present ideas and to allow all suggestions to be fully considered. The current time table would have resulted in having to limit discussions, consideration and the planning effectiveness due to time constraints. This limitation was considered to be inappropriate as we wish to appropriately accommodate everyone in the process. Consequently, the executive will form a Planning Group with several seconded members who will engage in a “Planning Preparation”. We will seek preliminary information in written form so it can be circulated before the planning meetings for wide consideration. Thank you to everyone for their expression of interest in the planning. We wish to include as many people as possible in the planning process in the most effective way we can. Further details to folllow regarding the next steps. In the 2007 New Years Honours, Mr Keith Stuart Mann, of Christchurch, was announced as Member of the New Zealand Order of Merit for services to sport, in particular fencing. "I would like to record my appreciation to the Association for its support and for the principal part it has played over the years in building the foundation for the nomination and subsequent award I received in the New Years Honours." "As with any such national award to an individual it is also recognition of the input and efforts of many people. My thanks to them and those involved in the nomination." "It is rewarding from a personal viewpoint but it is good for publicising fencing and it is nice to see that a minor sport such as ours can receive recognition in this way." The FIE web site now has the World Anti-Doping Agency (WADA) current list of prohibited substances and methods, along with relevant WADA anti-doping rules and relevant documents. Note that the updated list now includes cannabis and the "party pill" BZP. The FIE site also includes details for "Therapeutic Use Expemtions" for athletes who are required for medical reasons to use a prohibited substance. Go to the President's Corner and select the article "FIE Web Site - Current World Anti-Doping Agency Information". The article has instructions and link to the FIE web site. We are seeking expressions of interest from current FeNZ members and/or parents of members to contribute and assist our planning group formulate a new future and direction for FeNZ. Fencing New Zealand will be conducting a Planning Group Meeting over the week-end of 19-21 January 2007. We will include several of our organisations’ general members and/or parents in the Planning Group and process. We are looking for people who are excited by fencing, passionate about the sport, love to see the sport progress, have a special area of interest or expertise that may be of benefit to FeNZ planning and management. If this is you or you know someone who is, then please contact Martin Brill ( president@fencing.org.nz ) . In order to manage the smooth functioning of the Planning Group we reserve the right to limit the number of participants with out prejudice. The FeNZ executive will advise in due course of the Planning Group participants. 2006-12-23 02:42 - FeNZ President, Martin Brill: 2006 - review and our best wishes to all. Hon Trevor Mallard, Minister for Sport and Recreation, has advised our Association by memo, the details of the Government decision to decline to issue visas for certain forms of sporting contact with teams and individuals from Fiji. In essence "All sports people who are representing Fiji or Fiji national or club teams for sport will be prevented from entering New Zealand for the purposes of sport". Notwithstanding the above "where New Zealand is hosting a regional or international tournament that obliges New Zealand to accept participants from Fiji, they will be allowed to enter New Zealand if they meet regular immigration requirements. However, if any of the participants, officials or supporters are subjects of the government ban on the miltary and any coup associates, these individuals will not be permited to enter New Zealand." The Government will not prevent New Zealand sports people traveling to Fiji. Recent events in Fiji resulted in Sport and Recreation New Zealand (SPARC) requesting information from our sport and others regarding sporting contacts with Fiji, to allow SPARC to provide informed advice for the New Zealand Minister for Sport and the Minister for Foreign Affairs regarding future sporting contacts with Fiji. We also advised them that in 2007 Fencing New Zealand will be hosting an international event, the Oceania Fencing Championships. Also Fencing New Zealand is a member of the Oceania Fencing Confederation, which is sanctioned by our international federation, (the FIE) and we are currently working with OFC and the FIE to develop the sport of fencing in Oceania. Irrespective of the level of contact or impact on our sport, this is a matter which cuts to the constitutional heart of our obligations as a National Sporting Organisation, member of the International Fencing Federation and recognized sport of the International Olympic Committee. Please be assured, as an organisation Fencing New Zealand shall resist debates to take action which contravene our constitutional obligations (national and international) and shall remain true to our objectives of developing our sport of fencing for our members. Congratulations to all the 2006 Champions, well done to all the medalists, and thank you to all the participants, volunteers and supporters for your contribution. The results are available to the right of the home page under recent reults. Once again thank you and well done to everyone. On behalf of the Commonwealth Fencing Championship Team best wishes to all the participants of the forthcoimng Ocewani Junior Championships being held in New Zealand for the first time. Especially for the the Kiwi fencers - step out and take on the world, you can do it, and we belive in you. The women's epee team have led the way and have shown Kiwis can fly. The New Zealand women’s epee team of Jessica Beer, Jennifer Hope and Kathlene Revie won the Belfast Commonwealth Fencing Championship team event, beating the Australian title holders to win convincingly 45-38. In the semi finals Jessica Beer held on to assure New Zealand of a Women’s Epee Team medal. She scored the winning point in extra time of a cliff hanger semi-final match against South Africa. After nine consecutive bouts the team score was tied 32-32. A final minute of extra time added and Jessica scored the last golden touch. Kathlene Revie, Jennifer Hope and Jessica Beer first eliminated England to reach the semi finals and then took on the current Commonwealth Champion Team and top seed Austalia. This medal is the first for New Zealand at the Commonwealth Fencing Championships, and 36 years since Commonwealth Games medals were won by New Zealand fencers. “These women gave everything and won. This team Commonwealth Fencing Championship medal is fantastic and shows the strong effort from for our fencers since the Athens Olympics where we had only one fencer competing” said Martin Brill, team manager and president of Fencing New Zealand. Note those having difficulties getting results from the CFF web site http://www.cfc2006.org/results.html should click their refresh button as previously cached pages are being dislayed, not the updated page - click refresh to update your computer's cache memory. Get in quick - there are just a few days left for people to nominate their coach for the 2006 Wattie’s Volunteer Coach of the Year. As a sporting organisation, we would like to encourage you to spread the word on the programme and get people nominating! Nominations close on August 16 so there’s still time to nominate your star volunteer coach! I really have to thank [Martin Brill], and FeNZ, for having given me the opportunity to attend [the AFF Olympic Solidarity Coach] course -- I have benefitted from it in more ways than I can count. Beyond just the technical skills that were examined, Ioan Pop's insight into methodologies, and mindsets in the pedagogy of fencing were fascinating -- in particular the discussion on the new timings and the implications this has for teaching foil. It's going to take me a while to thoroughly assimilate everything that is in the notes I have taken, but the methods Ioan demonstrated for structuring lessons for high level fencers (especially the interplay of the technical/tactical aspects of a lesson) have already clarified so many things for me. It was also an excellent opportunity to meet and interact with other coaches from Australia and Malaysia in a friendly environment removed from the concerns and worries of a tournament setting. The coaching team in Otago is going to undergo quite a workout over the next few weeks as I pass on what I have learned from the last five days! Dave, On behalf of our fencing community, thank you for having attended and thank you for your on going committment to fencing and service to fencers. I would also like to acknowledge and thank all your behind the scenes supporters from your own local fencing community who have contributed in their way and shared your journey to this point, well done. I would also like to thank the other coaches who attended the Olympic Solidarity Coach Course, Sue Grant-Taylor, Barry More, and Daniel Chan and to also acknowledge and thank the fencing communities that support these coaches. Thank you, we are proud of you. Well done. Finally I thank our International Fencing Federation (Federation Internationale d'Escrime), Olympic Solidarity, the Australian Fencing Federation and the New Zealand Olympic Committee for their support of this development opportunity for our sport and our coaches. The New Zealand team to compete at the Commonwealth Championships in Belfast has been announced. Most team members will also be going on to the World Championship in Turin Italy. Many good fencers put themselves forward for selection but unfortunately not all can be successful. FeNZ is investigating an overseas training and competition opportunity for a development squad to take place early in the new year. Fencers who have not made selection this time and other interested parties are encouraged to apply. Further details will follow. See below for the full Commonwealth team. Fencing New Zealand would like to invite expressions of interest from individuals or groups who would like to be involved in Team Management, Refereeing or Coaching the New Zealand Team travelling to the Commonwealth Championships in Belfast Nth Ireland, 20 – 25th Sept. and on to World Championships in Turin Italy 30 Sept. – 7th Oct 2006. This will be a fantastic trip and time is short so please express your interest to Steve Martin (selector@fencing.org.nz) who is co-ordinating the appointment process, before Friday 30th June. The AFF Olympic Solidarity Coach Training course for advanced and developing coaches is currently being held in Melbourne. We have Dave Barson (Dunedin) and Susan Grant-Taylor participating in the Foil under the guidance of FIE technical Director Ioan Pop. Vlad Sher will be the Epee course instructer to our other two participants, Barry More and Daniel Chan. We are providing funding for these four coaches and have also obtained extra funding through the New Zealand Olympic Committte from the Oceania National Olympic Committees for which we are very grateful. These coaches are committed to developing their own skills and providing guidance and assistance on their return. Congratulations to Jessica Beer who placed 18th at the Peter Bakonyi International Women's Epee World Cup in Vancouver. She now sits on 26 points and moves up two places in the world ranking to 65th. Fencers who have met the minimum performance threshold and who would like to be considered for selection to the Commonwealth Championship team should now confirm their availability to the Selector if they have not already done so - selector@fencing .org.nz. As a reminder, the minimum performance criteria are listed below. Anyone who has failed to met the minimum standard but feels that they have a special case may put that case to the Selector by email for consideration. The last week was a bit more relaxed. Spent a bit of time doing team matches, mostly because everyone enjoys them so much, rather than for practice with them. Also we did some exercises that were less structured, like having someone stand on the end of the piste and an opponent attack them. Basically with both people able to do what they liked to try to score a point. We went to Racing Club again to practice there but this time there weren't very many people there, not sure why. Kuki had different people take turns at leading the footwork which was interesting to see. Good because now I have a whole selction of bizarre new leading and following exercises to take back and torture the school kids with. Yes aucklanders, if you're reading this I mean you! Its good to do more exercises that require you to concentrate really hard on the person leading them. As our coach said, it was really the first time for all of us to be able to be somewhere where all we had to do was eat and sleep and train, and a really good experience to be able to put training before other things. Most of the time we're at home we're not able to concentrate only on fencing because things like finding some money and studying tend to get in the way. Unless we live in Russia. But none of us did. There is an article about the training camps in the latest escrime magazine, I think. From what I have gathered they are planning to run a lot more of them (depending on finances), which sounds like an excellent idea to me. Thanks to FeNZ for giving me the opportunity to attend and of course to the FIE for their generousity. It was an excellent experience and I hope I have been able to take as much from it as possible. PS Daniel Levavasseur says hi to Martin and Kate. FAQ - New section can be found in President's Corner. Kindly copied with permission from rec.sport.fencing. Thanks to the author Morgan Burke and contributers. This is a list of Frequently Asked Questions (FAQ) with answers, compiled for the UseNet newsgroup rec.sport.fencing. We have taken on board a suggestion that the closing date for nominations should be brought forward to allow participants make travel arrangements. The new closing date for reception of nominations by FeNZ will be 6pm (18:00 NZST), Sunday 7th May 2006, with successfull nominees being advised by 10th May. Please advise all prospective nominee coaches of this change. AFF Olympic Solidarity Coach development course 17- 21June and 22-26 June, Melbourne. A new funding opportunity, the Don Oliver Scholorships for athletes in West Auckland. Check out the new section in " President's Corner " , " Individual and Club Scholarships and Funding ". Please check this section regulary as further opportunities will be posted here as the come to hand. Thank you to the four people who supplied their travel details regarding their future requirements. In the future, we may be able to establish a business case for a prefered airline for FeNZ members which is more compelling. For the moment the status quo remains. PDF file available soon from the Downloads "Documents" section FeNZ By Laws Mar 2006. Applications are now open for the AMP Scholarship Programme2006. Visit www.amp.co.nz for details and to apply. With Challenge Australia approaching, (FIE World Cup Men's and Women's Epee), it is timely tro remind fencers wishing to compete in any FIE / World Cup event they should first check their eligibility (see FeNZSelectionPolicy-June2005 under "downloads - documents", to advise the selector ( selector@fencing.org.nz ) and ensure you are up to date with an FIE licence and the FIE equipment requirements. Only fencers who are holders of FIE licences (must be NZ citizens) can be entered by FeNZ in FIE World Cup events. Jessica Beer and Jennifer Hope produced outstanding performances in the World Cup individual Women’s Epee event in Rome. Fencing strongly from the first round Jessica Beer stormed through the 115 strong international field from the start. She beat the world 8th ranked fencer, Sonja Tol (Holland) for the top 16 round where she came within an excruciating 1 hit of the final of eight, surviving a broken blade and torn breeches, to lose 14 -15 to Julie Leprohon of Canada, and taking 13th place. On the other half of the table, Jennifer Hope produced an excellent solid first round performance then qualification through to the last 64. On the second day of fencing, she was unable to advance further, finishing with a 33rd place. In the world standings, Jessica Beer moves up to 83rd and Jennifer Hope 90th. “This is the first time we have had two fencers at the same time in the top one hundred of the international ranking”, said Martin Brill, President of Fencing New Zealand. “The performance progress of both these fencers is excellent, a direct result of their quality training”. Giulio Gaudini International Memorial Tournament, Rome (Women's Epee World Cup). A fantastic effort from both Jessica Beer and Jennifer Hope with world cup points winning performances. Absolutely positively brilliant performance from both these fencers. We are proud. This is also significant as it is the first time that New Zeland has ever had two fencers both ranked in the top 100 in the world. Jessica Beer is now ranked 83rd and Jennifer Hope 90th and both in women's epee. Congratulations. 2006-03-14 23:01 - Congratulations Jessica - three in a row! Congratulations to Jessica Beer, another world Cup points winning performance – that is three in a row. Her 51st place is a really great effort. But more significantly, Jessica has now produced international world cup points winning performances consistently. Clearly the new training regime in Budapest is working very well for her. The performance boundary is being pushed and extended. Well done. To Make your Dreams Come True we would like to hear from fencers at all levels, to find out what fencers need. What wish would you make, for your dream to come true? What would you ask a fairy god mother for? Email your requests secretary@fencing.org.nz Please put Dream in the subject line. Two weeks ago a forum question was asked regards FeNZ obtaining a standing excess bagage allowance for fencers. I promised I would develop a proposal and asked for indications of expected travel for the next year and the prefered airline. No responses received. I believe the original post is a good idea, but it can only be turned in to reality with the good will and support of our members. Please respond. Please encourage as many of your fellow members to also respond with the expected number of flights (national and International), its anticipated dollar value and your preferred airline. mailto;president@fencing.org.nz Please put Bagage in the subject line. Jessica Beer progressed through to the top 64 after the first day of fencing. At the time of writing Jessica begins her first DE 64 bout against Nathalie MOELLHAUSEN (ITA) at 10:20pm NZ time. Now with the inclusion of the top 16 ranked fencers who were exempt the first phase of competition, Jessica is 42nd seed vs Nathalie Moellhausen 23rd seed. Final placings Jessica Beer 48th, Jennifer Hope 86th - total of 121 fencers competing. Competition won by Sherraine McKay (Canada), Imke Duplitzer (Germany) took silver. This week-end 4th March, Jessica Beer and Jennifer Hope are competing in the women's Epee Wurth Cup, in Tauberbischofsheim, Germany. The following week-end (11 March) they both move on to Athens for the "Athens Cup", folowed by Rome on the 17th March.. The same week-end as Athens, 11th March, Andrew Kell and Sandy Paterson will be competing in the Prince Takamado Men's Foil World Cup in Tpkyo before returning back to NZ. This event was not hold - postponed. New date to be advsied. Results Andrew Kell, Sandy Paterson and Luke Robertson - eliminated first round. After a busy month iinternationally, there is a break for a couple of weeks before the SK Telecom Trophy FIE WorldCup events in Seoul has Luke Robertson in the Men's Sabre FIE Grand Prix and Andrew Kell and Sandy Paterson the Men's Foil World Cup events. Jessica Beer wins bronze, in the SAF Polaken " Rehbinder Prize " for Women's Epee and picks up 2 more World Cup points for her third place in the FIE Satelite A Grade. Also in Stockholm, Seino Jongkees competed in Men's Epee. Reminder that the following safety standard is effective from March 31st 2006 to meet our committment to providing a fencing environment that we can all participate in, safely. In all FeNZ competitions (includes NZ Cup events) FIE stamped blades will be required as per FIE requirements. CE 800 Newton resistance standard (CEN) 800N jacket, plastrons, trousers and mask. Clothing and equipment with CE 800N or CEN 2 meet this standard. CE 350 Newton resistance standard (CEN) 350N jacket, plastrons, trousers and mask (bib 350N). Clothing and equipment marked with CE or CEN 1, or CE 350N meet this standard. Then from 1st January 2007 the Clothing requirement for all FeNZ Championships and FeNZ events (includes NZ Cup events) will be CE 800 Newton resistance standard (CEN) 800N jacket, plastrons, trousers and mask. See President's Corner regarding full description of the clothing standards. To be held 18 March, at 10:30am, Wellington Fencing centre, 69 Tasman Street, Wellington. See President's Corner for Notice of AGM. Note any nominations for President, Secretary, Treasurer, Patron and Auditer have to be received by FeNZ by 25 February 2006. We are saddend to learn of the news that Richard Hall passed away on Tuesday afternoon, 7th February 2006. Richard will be forever remebered as a hero of our sport. He was the 1968 Individual Men's Epee Champion. Dedicated to his club, Wellington Swords and fencing, he held the post of Club Captain. We extend our thoughts and sympathy to his family for his passing. We acknowledge the contribution that Richard made to our sport and the difference he made to the lives of those close to him and in the lives of all those he touched. Richard Hall, we salute you. The new competition calendar for 2006 is now available so it is probably timely to remind senior fencers of the selection criteria for Commonwealth Championships as published last year in the FeNZ Selection Policy. As is usual for NZ senior team selection, North Island Championships will be a trial for this event and it is anticipated that fencers will be named by the end of May. Any interested fencer who is unable to attend the trial should present a very good reason (such as a severed limb, demonstrably your own, in a bucket of ice) to the Selector well in advance. See below for detailed info about performance thresholds. The final "Halt!" was called on Sunday 29th January 2006, followed by the closing ceremony. To each and everyone our warmest congratulations and best wishes. ... Kia Kaha ... " Stay Strong / Stand Tall " . So we say our good-byes and a final massive THANK YOU to our hosts the Fencing Association of India. To the organisers in Chennai the Tamil Nadu Fencing Association thank you for a job well done. To the referees, thank you, and all the other teams we really appreciated your participation and best wishes. To all the team members thank you and especially to the Coaches, Manager, Supporters, (Sue Grant-Taylor, Barry More, Steve Clarke Francis and Tony Cuncannon) and all the parent helpers and clubs back in New Zealand - well done. We are pleased to announce the successfull recipients for the 2006 Prime Minister's Athlete Scholarships are Monique Coleman, Sarah Tabak, Andrija Sesun, Leah Hamilton, Katherine Taylor. In the very near future we will need to have more referees and also event organisers (Technical Directors) who are qualified at international level. To this end we are now seeking people interested in investing their time towards developing these specific skills, with an eye towards the future of being internationally recognised as competent and being able to participate in the running and organisation of FIE competitions - as referees or technical directorate. Vicci Lamb has been working on the Competition Calendar and that should be available soon. For Seniors we are having a dedicated National Teams Chamionship. And for Juniors look out for the 2006 Junior Oceania Championships, which we are hosting. Full program available very soon. The NZ Master's Games are being held in Dunedin. Entries closed on the 13th January, But late entries are being accepted through to the 3rd of February - an extra late fee charge of $20 will apply. We encourage eligible fencers to enter this premier fun event. While many of us have been enjoying a summer break, we have fencers off shore training and competing throughout the world. Fencers are in Hungary, USA, Australia, China, Germany, Spain, and soon India. There will be fencers competing at the Australian Under 20's, The Commonwealth Fencing Federation Junior Championships in Chennai (India), the North American Cup, the Stockholm FIE Satelite A grade, the Weisser Baer (White Beer) in Berlin, Cairo, Copenhagen, Budapest, Prague, Paris, Tauberbischofheim (German national training centre), Rome, Athens, St Petersburg, Las Vegas, Havana, Buenos Aires, La Coruña (Spain), Seoul, and Tokyo. A veritable travelogue. We will keep you updated with their results. Update on World rankings for our fencers. We have six senior fencers and one junior fencer in the world rankings. We wish you all a successful and prosperous year. The FeNZ office will be closed from tonight through to the New year. For any urgent requests or information please contact first your Regional Council, then if required, our Treasurer Steve Clarke - or our Web Master Steve Martin (use the 'Contact us' option in the left side bar menu. Best wishes to you all and compliments of the season. Finally thank you to all the coaches, administrators, volunteer helpers, referees, parents, gofor-this, gofor-that, and the most important people in fencing, you the fencers, for having made the 2005 fencing season tick on over so well. Details on how to obtain an FIE licence is now available, see president's Corner, "How to obtain an FIE licence". or follow link below. Note for these championships there will not be a requirement for National colours (fern for NZL fencers) on trouser legs, except that where the national colours are being worn they must be the current FIE approved colours (Fern with NZL beneath). This guide, after including the 'exceptions' is relevant for FIE events. See " Invitations" - President's corner. The rankings have now been updated after the National Championship and the Selector has compiled the list of those eligible to compete in FIE A Grade events for the 2005/2006 season. Anyone outside the list below who wants to compete in an international event should make representations to the Selector well in advance. Anyone considering a bid for selection for the Commonwealth Championship should read the accompanying notes below. NZOC have asked us to circulate the following information. They are looking to employ someone within their Marketing Department to assist with all marketing, sponsorship and PR related activities leading up to, and throughout, the 2006 Commonwealth Games and 2006 Olympic Winter Games. At this time, they would see this as a short term appointment through to 30 April 2006, and the position would then be reviewed at that time. Position description is avilable either from FeNZ, secretary@fencing.org.nz, the secretary of your regional council, or call the NZOC on 04 385 0070 to receive a copy. The Prime Minister’s Athlete Scholarship programme is a Government initiative managed by the NZ Academy of Sport. The goal of the programme is to assist talented and elite athletes achieve tertiary and vocational qualifications while pursuing excellence in sport. Fencing New Zealand is grateful to SPARC and the New Zealand Academy of Sport for the opportunities that have been provided over the last four years for our fencers. $81,462 of scholarships have been received by fencers nominated by FeNZ. Over this period a total of 18 annual scholarships have been awarded to 13 fencers. For this period of FeNZ partnership in the Prime Minister’s Athlete Scholarship programme, the recipients have each received and benefited from one or more of these grants to cover academic fees which include a living allowance. The total values received by our recipients have ranged from $1,000 to $23,000. In 2005 we had 5 recipients who received a combined scholarship value of $34,105. Men’s Foil – Michael Hoskins, Women’s Foil – Lydia Wenborn, Men’s Epee – James Tabak, Women’s Epee – Sara Qi, Men’s Sabre – Thibault Lozach, Women’s Sabre – Samantha Woodward. On behalf of Fencing New Zelaand and the Fencing community I thank our hosts Fencing Mid-South (CPAFC) and all the volunteers and helpers who made the championships the BEST "Friendly Championships". No New Zealand individual medalists or teams event winners. The 2005 South Island Championships was the first event to be hosted the new fencing facility in Christchurch. Well done to Canterbury Fencers and CPAFC ... it is fantastic! For those who have not seen it yet, as well as a great fencing space it has a comfortable lounge, kitchen, great changing rooms (yes showers with plenty of hot and cold running water), plenty of good parking and good disabled access, with appropriate toilet and shower facilities. This project managed by The Fencing Institute is a partnership with the Christchurch City Council. It is greatly appreciated and is available to all fencers, locally and nationally. The entry form for this years South Island Championship to be held at the newly opened Fencing Institute in Christchurch can be found HERE . Nominate your super volunteer coach for the Volunteer Coach Of The Year awards. Make your volunteer coach count! Your school/club could win $500 sporting gear, your coach could win $5,000 towards coaching development, and you could win $2,000 cash - see entry form for details. Enter on-line at www.watties.co.nz or pick up an entry form from your school, regional sports trust. Entries close 24 August 2005. NZ Team has been increased to four with the inclusion of Sarah Raudkivi who will compete in the Individual Women's Foil. After a long illness, Bob Binning passed away in Brisbane early on Monday morning. I am saddened by the loss and extend to his family the condolences of myself and of the fencing community in New Zealand at large with whom Bob had a long association as a fencer. He will remain forever in our record books as a National Champion (Sabre 1955, '56, '57, '59, '61, '62, '63, '66 and also Epee in 1966) , a Commonwealth Games bronze medallist (1962 Men's Sabre teams). He is a hero and legend in our sport of fencing. Bob was generous in passing on his skills and experience. We have been enriched through his participation and are gratefull for his contribution. Bob was active in other areas and held in high regard in his communities. He was the Drum major for his Wellington Pipe Band that returned from Scotland with glory as Champions in 1948. He was well known personality in Wellington and throughout New Zealand. 2005-07-30 23:51 - 2005 World Champioship Fencers announced. Our Selector, Steve Martin has announced the New Zealand fencers to compete in the 2005 World Championships in Leipzig in October. to see fullarticle click "more"
Commonwealth Youth Championships (under 20) in Chennai, India 24-29 January 2006. FeNZ is supportive of this th e first Commionwealth Youth Championships and will require of potential participants a previously demonstrated minimum performance standard, for selection. The Management Committee have asked the Selector, Steve Martin, to consider and report back with options. The Manamgeent Committee have also stated that in the event of no fencers meeting the criteria the selector is to have discretion to select one (1) male and one (1) female fencer. Congratulations to all the winners, well done. A full week-end of School Teams fencing was held. The local Wellington Teams dominated in numbers and were overall champions, but they had a run for their money. The Christchurch contingent with a very competitive team had an imense presence. On and off the piste behaviour was superbe. There were highs and lows, but the bouts were well fought, with no quarter being given nor asked for. There were close matches, games of two halves, and in the end, on the day, Fencing was the winner. Thank you to Upper Hutt College for hosting the Championships. To all the volunteers who gave generously of their time to make the Championships possible, and to all the fencers who participated, there could not have been such a great week-end without your presence - Well done. Martin Brill (President, Fencing New Zealand). A recent ruling made by Sport Disputes Tribunal in a NZ sport doping infringement highlights the iissue. Fencers are reminded that the taking or use of performance enhacing substances are; banned by the rules of our sport, of Fencing New Zealand's Anti-doping policy,and that it is the fencer's responsibility to ensure they comply with the anti doping rules. For athletes who have a medical condition requiring them to use banned substances they should identify if they require a Therapuetic Use Exemption prior to participation in competition. 2005-06-01 02:18 - Liam Davies takes gold in 2005 British Army Champs. FeNZ is pleased to announce that the following fencers have been selected to attend the Australian Under 15 and Cadet Championships in Sydney from 1 - 5 July 2005. The Fencing New Zealand Selection Policy is now available for download here . It contains, among other things, some information that will be of interest to those considering making themselves available for the Commonwealth Championships next year. The current thinking regarding this event is that squad selections will be made by April 2006 and final team selections made by July 2006. It is also possible that squad members who are unsuccessful in making the final team may be invited to participate in a development tour to a second international competition on at about the same time. Your feedback/comments about the sanity of this plan would be appreciated and can be sent to selector@fencing.org.nz . A competition at Men’s & Women’s Individual and Team Foil, Epee and Sabre for fencers over the age of 40 years. All age groups will fence together in one competitions for each weapon. Prizes: In all individual competitions there will be Gold, Silver and double Bronze medals for the overall placings. There will be one Gold medal for each age group in each weapon. Team medals will be Gold, Silver and Bronze for each team member, including the reserve. All New Zealand participants must confirm they will assist with the refereeing. Congratulations to Hutt Valley fencing Club, for taking the initiative of bringing together an invited team of men's and women's foil fencers from Shanghai Financial University, locals and fencers from throughout New Zealand to fence, train, and compete. The bonds of friendship, learning and understanding were forged. We applaud you, especially Sue Grant-Taylor and all her helpers. Everyone spoken to described it, in a word, AWESOME!. Congratulations to the first four participants on the first Level 1 Foil Coach training course held over the week end in Wellington. The 20 hour fencing theory and practical course is followed by a practical coaching experience requirement and a final assessment. The FIE supported ' Oceania Fencing Master's Academy ' course leads to internationally recognised fencing coach qualifications, from Level 1 to Level 3. The Australian based course can now be conducted in New Zealand as a consequence of Martin Brill's formal recognition of competancy and training in the course and asessment last year, at the Olympic Solidarity Coaching Course in Melbourne. Thanks to the investment support by Sport and Recreation New Zealand FeNZ is now able to offer this OFMA training course in conjunction with the the Australian Fencing Federation. The Level 1 course is the first stepon the learning path through to Level 3 and "Fencing Master" level. There is also an opportunity for current coaches to obtain recognition of their prior learning (RPL) and have their previous qualifications, skill and ability to be recognised. Details of this are currently be finalised. To all the vice-champions, medalists and finalists - well done. To all the participants, coaches, refrees, organisers, helpers, fetchers and carriers, and vistors from a far thank you. Your involvement is appreciated and added to the fun and excitment of the event. See you all again next time. In line with the newly adopted FeNZ Selection Policy (to be published shortly) the Selector is undertaking a review of the list of competitions eligible to accrue ranking points. It seems likely that foreign domestic competitions with the exception of Australian ranking tournaments will be excluded, the list of eligible NZ domestic competitions will be limited and the points allocation for each tournament will be set to give more weight to the big three events (Nationals, Nth Islands, Sth Islands). Competitive fencers should consider the implications of this when planning their competition year. I have started a forum topic on this issue and encourage you to make comments and express your ideas. Note FIE licence is required ($NZ55). Entries can only be made through FeNZ. Depending upon numbers, FeNZ may require a participation fee to be paid prior to final entries being made to cover organisation costs of referees / admistration . Buist, Arthur Greig, and Megan Kingdom. There are many Heroes & Heroines Of Our Sport. So we can know and celebrate their achievements we have compiled a list for our Olympic Games and Commonwealth and Empire Games representatives. Melody Coleman (Dot Garde) is our only Commonwealth Games Gold medalist. We are proud of her achievement. She went down in history for also winning the first NZ medal at the 1962 Empire games in Perth. What about the silver and bronze medals? Who else participated? How did they fair? Check out "President's Corner" under "Heroes & Heroines Of Our Sport. Congratulations to all the winners of the 2004 NZ Cup - Well done. Also an appreciation to all the coaches and clubs that have contributed to the success of these champions. Thank you for a great effort. Finaly a very special mention to Fencing Mid-South's council members. To have five out of the six champions in your region is impressive. It is a magnificent feat. It is significant, it is not an accident. Proof that their direction works and can pay dividens. Something good is happening. Well done to Steve Clarke, his council and members. Your strategic planning, team work and support for the fencers is clearly a significant asset and gives your fencers a winning edge..
Congratulations to you all - well done!! The best site for finding out what competitions are on anywhere in the world, from Cadet competitions to Veterans, the major national, international FIE world Cup, Grand Prix and World Championships also has the week by week results and world rankings of fencers with graphs on how they are trending ... who is going up and who is going down ... http://www.nahouw.net/ ... check it out. "Today I fenced in the Colorado Cup Open and I am pleased to say that I won a silver medal." "Going into the DE's I was ranked 7th. On my journey to the final I faced some of Colorado’s best. In the top 8 I beat my opponent 15 - 14 into overtime with his priority he was so angry that he came very close to a black card. A victory against one of the Iowa brothers put me in the final with one of my training partners Nick Chainman who came 7th in the Cadets Epee in Plovdiv. Final score 15 - 11 to Chinman." "Overall I fenced a thrilling 5 DE bouts. It was a memorable day for me." France - the Challenge internationale de Saint Maur (suburb south-east of Paris) Jessica Beer 68th and Jenifer Hope 110th - more information and details as it comes to hand. Andreas Sesun's 16th place in his first Junior World Cup event gives him 8 points and places him at 171 on the World Junior rankings, out of 433 ranked junior fencers. 2005-01-19 00:46 - A busy week-end for our fencers overseas. Best wishes to all our fencers competing overseas. 21st January Jenny Hope and Jessica Beer are fencing in the Westend Cup in Budapest, Hungary. They then fence in Prague on the 29th and then the 5th February it is to Saint Maur (Paris), France. Tableu 64 results will be available off the FIE web site. Training and competing overseas, we also have Andreas Sesun. We wish him well on the 22nd January fencing in his first Junior World Cup Competition, the Tournoi Carl Schwende, in Montréal, Canada . He then goes to Germany to fence on 30th January in the Radio Ton Cup in Tauberbischofsheim. Andreas left early January to take up the opportunity to prepare and train with Andrea Lagan in Colorado. He will travel in conjunction with the US Junior Men's team. Andrea Lagan is a New Zealander and hails from Auckland, now based in Colorado and is coach for the US Men's Junior Epee team. We thank Andrea for her assistance in providing this exciting opportunity. Fencing New Zealand appreciates the support of SPARC and their High Performance Network, the New Zealand Academy of Sport. Thank you and congratulations to all recipients. Also thank you to the applicants who were not successful. We appreciate the effort they made and wish them well in achieivng the goals they have set for themselves. The NZ Academy of Sport have invited Fencing New Zealand to participate in the Prime Minister's Athlete Scholarship programme. The purpose of the programme is "to assist talented and elite athletes achieve tertiary and vocational qualifications while pursuing excellance in sport." The scholarships being made available through us are for our athletes who are competing at a top national or international level. Athletes who receive a scholarship will have their academic fees paid (max $10,000) and, if eligible, receive a living allowance (max $6,000). NOTE: Applications must be sent to FeNZ - see below for further details. I am saddened to learn today of the sudden passing away of Murray Goodman. He was dedicated, passionate and generous. Murray was a long time fencer, coach and a founding member of Christchurch Fencing Academy. Thank you Murray. We will miss you. We salute you. The rankings have been updated accordingly. Entry forms available in link from tournament calendar. Local entries must be made by snail mail with entry fee enclosed - so dont forget. Congratulations to Monique Coleman who won all three weapons in the women's events and to Andreas Sesun who wom the men's foil and epee and to Thibault Lozach who took out the men's sabre. Further results below. Follow-Up Coaching Course: Application for a Coach training course to be held in New Zealand with Ioan Pop is being made for January 2005. The Oceanic Fencing Masters Academy, the FIE sponsored coach training centre in Australia, have agreed to assist in establishing a functionning coach training program for New Zealand. Progress is curently being made with the accreditation of instructors and course assesors/examiners along with discussions on procedures for recognition of our current coaches, their training, experience and competance. OFMA Coach accreditation is a three level structure. Level 1 coach is introductory/base club level training. Level 2 is giving individual and group lessons, and level 3 covers skills of high performance fencer training and the training of Coaches. There are fencing specific compenents and generic sport coaching requirements. The coach training modules currently offered through the Regional Sports trusts will be applicable to our courses. Fencing New Zealand has been requested to nominate one young woman and one young man from our sport for the Olympic Youth Camp being held as part of the Games of the XXVIII Olympiad in Athens 2004. The Olympic Youth Camp runs for 16 days from 11 – 26 August 2004. Participants need to fill out the application form and write a short essay (500 word maximum) on how, as an athlete, they can underpin their athletic activities with Olympism and carry these ideals into their everyday lives. Applications must be received by FeNZ before midnight, 3rd February 2004. The candidates selected to be nominated by Fencing New Zealand will have their applications forwarded to the NZ Olympic Committee along with a letter of support by the closing date, 10th February 2004. As part of the process of introducing the World Anti-Doping Code, NZSDA has made some important changes to its requirements concerning medical declarations and notifications. These are effective from 1st January 2004. A summary of these changes is provided below. Further detail can be found on the NZSDA website. • Prior to 2004, corticosteroids (brown preventers) in inhalers and bronchodilators were permitted. They are now permitted ONLY WITH ADVANCED MEDICAL NOTIFICATION. They are therefore in the same class as Beta 2 Agonists (Blue relievers) and fencers using these medications must complete the “Abbreviated Therapeutic Use Exemption Application Process”. This requires their doctor to compete a form available from the NZSDA website. Note that this form is different from these used previously and a new form must be completed for 2004. The necessary forms can be found on the Therapeutic Use Committee webpage (click on “Therapeutic Use Committee” on the left of the home page) at the NZSDA website. The New Zealand U20 Teams Event representatives for the Australian U20/Oceania Zone Championships have been announced. The Selectors have named the holders of the first three positions in the each team with the fourth being a "wildcard" position to be filled at the completion of the individual events at the championships. The primary objective of this camp will be to finalise preparations for those fencers attending the Oceania Youth Championships held in Melbourne from the 22 - 25 January however places will be available to others should numbers allow. Could interested fencers confirm their intention to attend this camp by email to secretary@fenz.co.nz. Social Fencing Camps for over 30's. 19-20-21 March 2004, Dijon, and 21-22-23 June 2004 Vichy. Interested in social fencing with a French touché? Contact FeNZ for details. There is now a page on the FeNZ website about sports drugs and drug testing. The page aims to help fencers understand how the activities of the NZ Sports Drug Agency, particularly the Agency’s testing programmes, may affect them, and it provides links to other sites that contain background information including information about banned substances and doping practices. The page also provides guidance for tournament organizers to help them understand the requirements of Drug Control Officers should a tournament be selected for In-Competition testing. FeNZ’s criteria for establishing whether a fencer needs to be included on the NZSDA’s Out-of-Competition Register are given on the webpage. Important: If you are thinking about fencing overseas next year, please check this page to see whether you need to be included on the Out-of-Competition Register in order to be eligible to fence in the event. Instructions for what to do if you do need to be registered are provided. And, yes, the rankings have been updated to reflect the results. Full results are now available and have been incorporated into the rankings. Great competition, some great fencing, and a fantastic venue. A big thanks to Gaylene Ongley and the rest of the crew who gave their time to make these competitions a success. Dont forget to get your entries in for the National Championships 2003. Entries are due to close on 30 Sept. Entry forms should be available from your Region but if not click here . Results from Day 1 of the National Secondary Schools Champs being held in Auckland this week. Mens Foil was won by Michael Hoskins of Auckland and the Womens Epee by Sarah Tabak of Christchurch. New Zealand has been offered 8 places at the 4 day training camp to be held prior to the Oceanea/Australian U20 Championships in Jan 2004. All weapons are catered for and the camp will provide athletes with an opportunity to finalise their preparation for the U20's and learn activites that can be used in training in the future. Expressions of interest to be sent to FeNZ at PO Box 5561 Wellington or email president@fencing.org.nz by 12 October. The AGM will be held on Saturday 20 September from 11am – 1.00pm in Wellington. A Planning meeting will follow, 1:30-4:00pm, to scope an initial calendar of activities and planning requirements for the coming term. Nominations are being called for the position of Team Manger for the New Zealand Under 20 Team to the Oceanic Zone Under 20 Championships being held in conjunction with the Australian Under 20 Championships. The Manager will need to be available to manage the team’s organisation prior to departure, as well as manage the team during the event and it’s return. Nominations for manager to be received by FeNZ by 13th September email to president@fencing.org.nz or post to PO Box 5561 Wellington. U17 team and U15 selections to compete in Sydney 4-8 July have been announced. The winners of the U17 championships both individual and teams will be the inaugural Oceania Zone champions. Congratulations to you all and good luck. Read more to see the team announcement. The Australian Under 17 Championship is being run as the Oceania Zone Championships as well this year. It is being held 4-8 July in Sydney. The individual competition is 'open' , i.e there is no limit on the number of New Zealand fencers who can compete. The team event fencers will be selected from those available to go. F.I.E standard equipment will be required. If you have any questions or would like to register your interest in competing, email selector@fencing.org.nz as soon as possible. Congratulation to all the winners of the 2004 NZ Cup. A great reward for your committment, dedication and consistency of your fencing performance. Also we applaud their coaches and clubs who provide the oportunity to excel. We appreciate your efforts, thank you. Finally a special acknowledgemet to for the contribution that the Fencing Mid-South Committee has made in being a stand for the fencers and a support in their endeavour. Great team work. Five out of six champions from one region is one for the record book. Once again, to you all, well done.